In Mexico, wind power could play a central role in the country’s future power mix. Unfortuantely, the technocratic top-down approach chosen by the country in order to deploy the technology has lowered social acceptance. Juan Mayorga suggests to look to Germany for a different, more democratic model of wind power development that takes local stakeholders seriously and allows local financial participation. 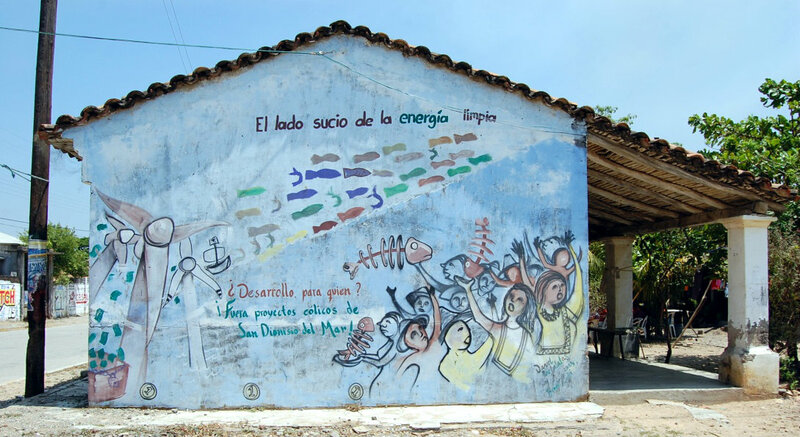 “The dirty side of wind energy”, depicted on a wall in San Dionisio del Mar, Oaxaca, in the South of Mexico. Mexico is trying hard to foster renewable energy to catch up with its ambitious GHG mitigation commitments, which call for a 30% emissions reduction by 2020 based on 2000 levels. In order to attain this goal, Mexico is turning to the blustery winds of the Isthmus of Tehuantepec. This southern region has an overall wind potential of 40,000 MW, and several zones reach wind speeds of over 800 W/m2 (that is better than those available in the northern German state of Schleswig-Holstein and, for wind energy purposes, beyond excellent! ), according to the U.S. National Renewable Energy Laboratory. However, the most challenging hurdle that the Mexican wind sector faces is the engagement with the local populations that own the land where major wind parks are intended to be set up. The Energy Ministry announced last January that, together with private investors, it would funnel 14 billion USD in the sector over the next four years, expecting to generate up to 9,500 MW or 8% of Mexico’s total electricity production. However, ill-conducted communication procedures and negotiations with rural and indigenous populations who own the land have led to a slowing or complete halt of important wind projects. Perhaps the clearest example for this problem is the suspension of the Mareña Renovables Wind Power Project. Planned for a generating capacity of 396 MW with a total of 132 turbines, the project was meant to become the largest wind park in Latin America. In early 2011, the project had obtained enough investors and permits and, technically, everything was on track to begin the construction process. However, increased uncertainties among the residents regarding the distribution of benefits and the effects the massive park could have on public health ultimately turned into a frontal opposition that stalled the project altogether. The construction of the Wind Park in San Dionisio was halted by social conflict. Mareña Renovables failed because it was developed through a top-down approach. It was undertaken by a holding consisting of Mexican and foreign companies. There was no ownership by the local populations in the project. As a result, most of the people in the community regarded the project with skepticism. People felt that their concerns did not matter because the project details had already been arranged and agreed upon by the government and the various investor companies. The situation worsened when the government used the state police to remove the blockade that some of the local residents had set up to prevent the wind park from being constructed. The wind park in Gotha, in Germany, also started without major local consensus, but the radically different project scale made a difference. It started out with only 19 turbines (currently has 63), which proved to have a less severe impact on the community and set the tone for a rather proactive approach of the developer to negotiate with the residents. The top-down style of the Mexican case stems from the project’s investor design, which excluded proactive participation from anyone other than of the large financial stakeholders. 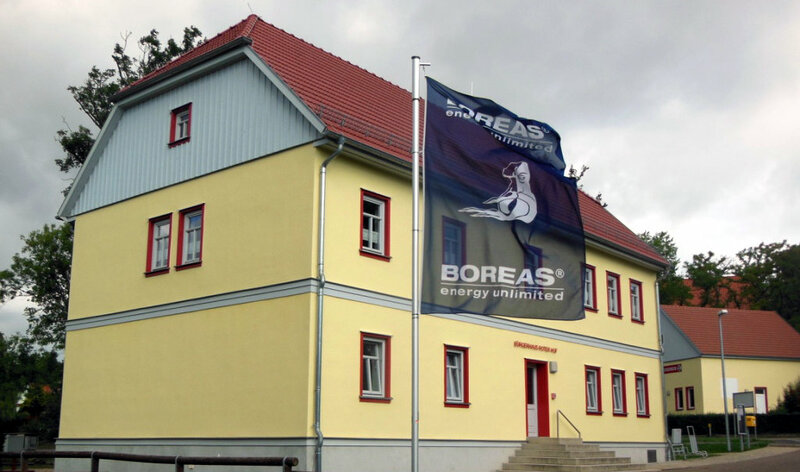 A flag of the local wind developer in Gotha, Thüringen, waves outside a refurbished communal building. Even though the German case did not involve an energy cooperative, planners gave residents the opportunity to participate in the project through relatively small investments (starting from 5,000 euros). The participation of the Mexican case was restricted to the payments for land leasing. And there were constant complains among the people leasing their lands that their rents were much lower than the international standards that lie around 600 USD per year). 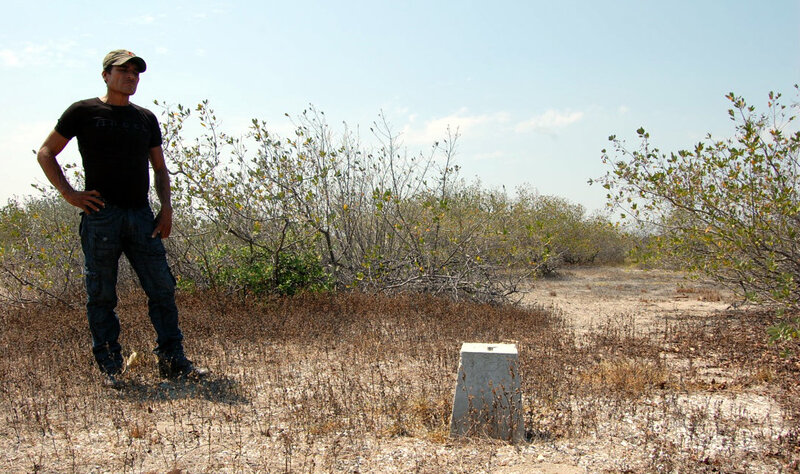 A woman from the Mexico case said she received the equivalent to 65 USD for four hectares of land for a whole year. This is the main difference between the Mexican and the German examples. While Mexico is unable to socialize its business model to allow for more diverse and local ownership structures, Germany has seen its wind sector take off precisely because people are allowed to take a financial stake in the projects. The construction and maintenance jobs associated with building wind parks can also have an impact on how a project is perceived by the local community. In the Mexican case, local communities’ position was conditioned by previous experiences with wind parks, where highly specialized positions were filled by foreign operators while just some minor surveillance posts were left to local residents. Likewise, all the components of the turbines for the Mareña Renovables project were planned and built abroad. The general perception was that benefits of the project were largely going overseas, mainly. As a result, the wind park was regarded as new colonial process or, as opponents would refer to it, a “Nueva Conquista”. In contrast, the project planner in the German case was local and today accounts for at least 90 staff, a job contribution that had a welcoming side effect in the region. Juan Mayorga (@JuanPMayorga) is a Mexican journalists reporting on environmental and social issues, particularly on energy transition, land use change and urban mobility. He writes for several Media outlets like CNNMéxico.com, Crónica Ambiental and KajaNegra.com.mx. He holds a master on Public Management with specialization in GeoGovernance from the University of Potsdam.